Dr. Liebschner is an Associate Professor in the Department of Neurosurgery. The is the head of the Computational and Experimental Biomechanics Research Initiative at BCM and the MEDVAMC. His research interests are in computational and experimental biomechanical and in biomedical robotics. Dr. Kim is a Professor in the Department of Neurosurgery and the Director of Spinal Neurosurgery and Reconstructive Peripheral nerve surgery. His research interests are in minimally invasive endoscopic spinal neurosurgery, spinal cord and peripheral nerve injuries and regeneration, reconstructive repair of complex spinal injuries, and traumatic head injury. Dr. Ehni is an Associate Professor in the Department of Neurosurgery, and he is the Chief of Neurosurgery Services in the Michael E. DeBakey VA Medical Center, one of the busiest VA medical centers in North America. His research interests are in neurosurgical intensive care and physiological disturbances after head injury. 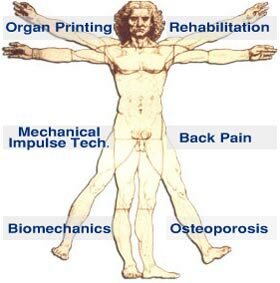 Our main missions are conducting modern biomechanical investigations of the human body include the mechanics of the musculo-skeletal system and movement control from a macroscopic (organs) level down to a microscopic (cells) level, the basic elements of life and growth, utilizing engineering skills to perform application-oriented research in medical technology and accelerating the field of functional tissue engineering.